A cup of tea enjoyed outside Mission Creek Cafe, where several Tea With Strangers sessions have been held. Photo by Leslie Nguyen-Okwu. 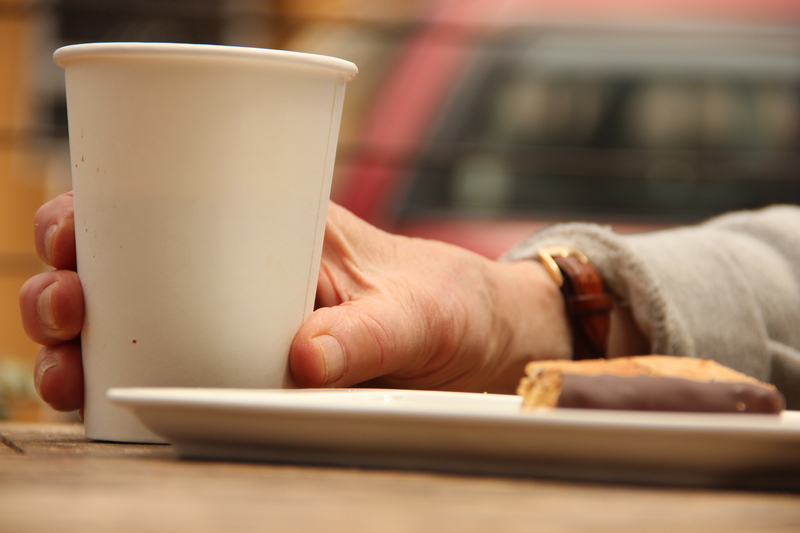 A new endeavor called Tea With Strangers hopes to change the way strangers interact. Yet, as its name suggests, its method for doing so is a decidedly age-old one: it facilitates tea parties. Founder Ankit Shah and his team of seven volunteer hosts have met nearly 500 people in the city through regular free “tea times” held in cafes across the Bay Area, including the Mission Creek Cafe and Stanza Coffee in the Mission District. Relatively open-ended affairs, which last up to two hours and tend to be filled with deep conversations, there’s no pressure to impress at a tea time, but rather, a hope to connect. People sign up on the website for a session and choose a time and location that suits them. Each tea time holds up to five people and a volunteer host who helps start the conversation; its direction is up to the group of people. Tea With Strangers is completely free, but participants do buy their own tea—hosts like to stress that Tea With Strangers has less to do with tea and much more to do with conversation. The host and two attendees, all in their mid 20s and working at tech companies, were free to answer in any way they desired. The discussion quickly jumped from the standard topics of hometowns, families and careers to deeper discourse on the conflict between masculinity and creativity through art. Started in March of 2013, Tea With Strangers is spreading fast. Since their website launched, Tea With Strangers has hosted 46 tea times in the last six weeks and will soon expand to other major cities including Boston, Washington D.C., New York City, Chicago and Los Angeles. In addition to San Francisco, the project is currently in Princeton and Miami, with copycats already at Georgetown University. Shah began hosting tea times while he was a student at the University of Pennsylvania. As a senior, Shah wanted to meet more people before graduation. To do so he built a website and advertised for strangers to set up times to have tea with him. He saw it as a simple way to meet new people but ended up spending every night for about two months in long, often intense, conversations with total strangers. Since graduating in June, Shah has been dedicating his time to promote and spread Tea With Strangers. He says he’s not looking for funders currently, because “there’s really nothing to fund” at the moment. Tea With Strangers is entirely run by volunteers. “I’ve always thought that a lot of who I am comes more from what’s between the lines of my resume: the lessons I’ve taken from my experiences,” said Feuer, who is a doctoral candidate in biomedical sciences at UCSF and started volunteering as a Tea With Strangers host two months ago. Feuer has learned to swiftly guide the flow of conversation with strangers, who range in age from their teens to their 60s. She says that in tea times she’s seen people get angry and she’s seen tears. Two weeks ago, a young woman back from her first year of college burst into tears after opening up about the overwhelming homesickness she experienced. She wasn’t expecting to share such personal details of her life but the entire group came together to console her, Feuer explained. Shah’s grander vision for Tea With Strangers lies in making it “easy to be nice,” despite the humdrum of daily life and stresses that people sometimes encounter in cities as large and diverse as San Francisco.